Most of my friends would probably categorize me as a social networking junkie. I do spend a lot of time on facebook, Twitter & Foursquare. Whether it’s for my job(s) at Yeah! Management / Artist Arena, working for Idle Hands, the bar 2 of my friends and I are opening or just talking about food via SteakClub7 or this site, I find social networking to be a very valuable tool. As a result of my recent obsession with foursquare, I met Ryan from Blue Fountain Media. He is a web designer and the Foursquare Ninja behind http://foursquarebadg.es/. If that wasn’t enough, he is also the man behind Table Share. The idea behind Table Share is to get a great deal on food at a restaurant by dining with a bunch of people you’ve never met. It’s real world social networking around food. Sounds like half my life! 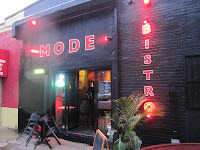 The inaugural Table Share event took place at Mode Bistro in Brooklyn. Ryan told me “it’s one of my favorite burgers in town. Their blue cheese burger with truffle fries are AMAZING!” Ryan asked me if he could bring some of the Table Share folks out for a Burger Conquest at Mode and I of course said yes. That got me thinking that it’s been way too long since the last Burgercon and this was a perfect excuse for another! The Burgecon, now in it’s 4 occurrence, was finally going out of the Manhattan borough. Burgercon 1 took place at the Shake Shack. Burgercon 2 went down at the Trailer Park. Burgercon 3 went down at RUB B.B.Q. 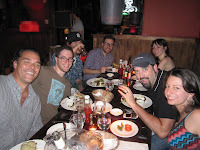 and Burgercon 4 was happening at Mode Bistro in Williamsburg, Brooklyn. This neighborhood eatery and lounge is a perfect example of a business that “gets” and understands its client and surrounding neighborhood. Williamsburg, as you probably know is filled with a lot of artists, musicians, students and yes, hipsters. 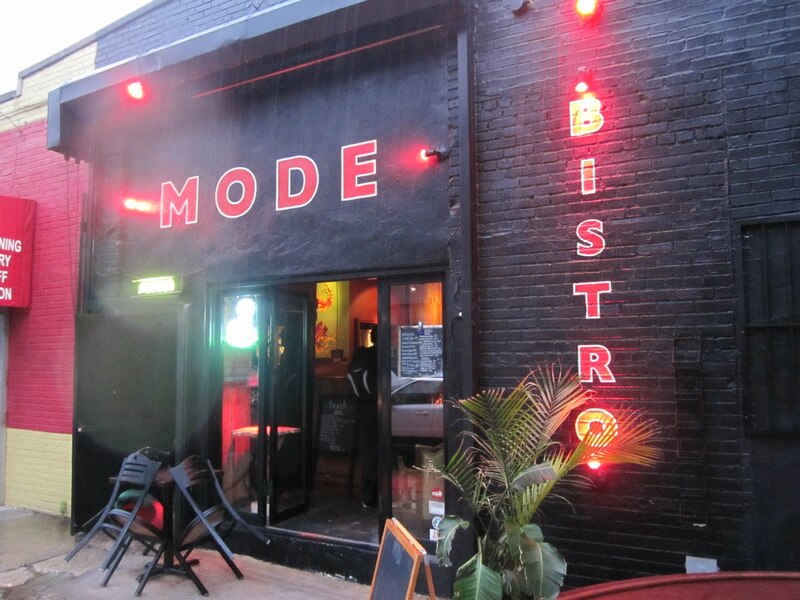 Mode offers a 2 level dining experience with a lounge upstairs and an oak bar downstairs. They have live music on Thursday and have art supplied by lesser known artists. 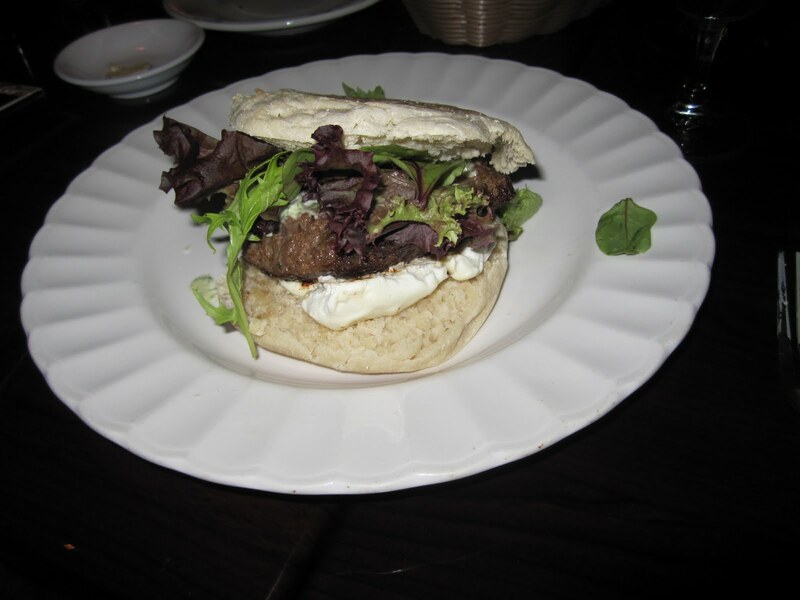 Their menu is a mix of traditional American fare made with French preparations. Unfortunately due to busy schedules and a huge rain storm, some of our fellow bloggers ended up not making the event. However, we were joined by Jackie from Burger Conquest, Dmanburger JD from 101wich and Mike from Green Arm Management. After a few get to know you, how have you been, what have you eaten recently type conversation over drinks, we made a move on the food. 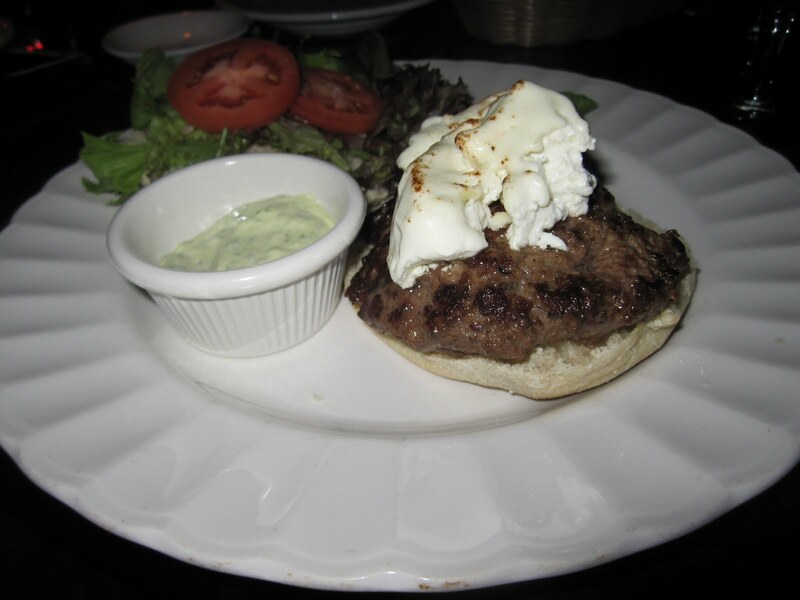 The Mode Bistro burger or as they call it “Burger Aux Fromages,” comes with either blue cheese or Swiss cheese and a choice to add sauteed mushrooms. I ordered mine medium-rare on a grilled English muffin. Sounds good right?!? When the sever gave us the additional option of goat cheese, I jumped at the chance. 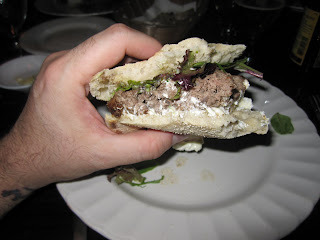 Goat cheese is a dense and creamy cheese that has a distinct sharp and bitter flavor and I thought it might add a really unique flavor to the sandwich. We of course request a couple bowls of the truffle fries to accompany the burgers. Although there were only 7 of us and the restaurant was only moderately busy, it took a good 45 minutes before we were served. I pounded back several beers during the wait but I was getting really antsy and hungry and we all know, an antsy Rev is a bad Rev. Finally the burgers arrived and I couldn’t wait to eat mine. As we all started in, person after person realized their burger was over cooked. Mine in fact, was well done. The table chatter began and as if on cue, the restaurant’s owner,Olivier Morange, came over and in a joking manner, in his best French accented English, scolded us for all ordering burgers at the same time. He may have thought he was being funny but it honestly just came off as rude. It wasn’t like the night was a surprise and neither was the order. Ryan had coordinated with the restaurant to let them know about our excursion. He took this approach in all his communication with us. I really didn’t appreciate it to be honest and if you know me, there isn’t much that offends me while joking around is my general state of being. Attitudes aside, let’s talk about the burger. The grilled English muffin was great and the photos just don’t do it any justice whatsoever. The melty and warm goat cheese added a unique flavor that I really was into especially when pressed up against the bitter greens. Nice touch. The restaurant used good, quality and well packed meat. It had good flavor, was juicy and good in all the right ways. Overall I enjoyed the burger but the owner’s approach really brought the evening down for me. Having said that, Ryan was right … the truffle fries were definitely the star of the meal. Big thanks to everyone who attended and to Ryan for organizing the meal. Looking forward to a Table Share soon! This entry was posted in Uncategorized and tagged the great burger conquest hamburger cheese french fries review new york ny nyc brooklyn williamsburg mode bistro dmanburger 4square foursquare badges tableshare. Bookmark the permalink.